I haven’t added to this blog in quite a while because I’ve been so busy with my genealogical speaking and research for clients, but I was in a genealogy class recently in which the instructor said we should all go home that day and write down one family story that only we knew and we should share it with other so it wouldn’t be lost. Woodward stereoscope. Photo by author. My mother told me this story a number of years ago. I don’t think any other living person in the family knows it. It concerns my grandfather, Harold Benjamin Hundey (1907-1987) and his maternal grandparents, Merritt J. Woodward (1846-1928) and Ellen Crout Woodward (1851-1915). One day when he was a little boy, my grandfather was home in bed, sick. 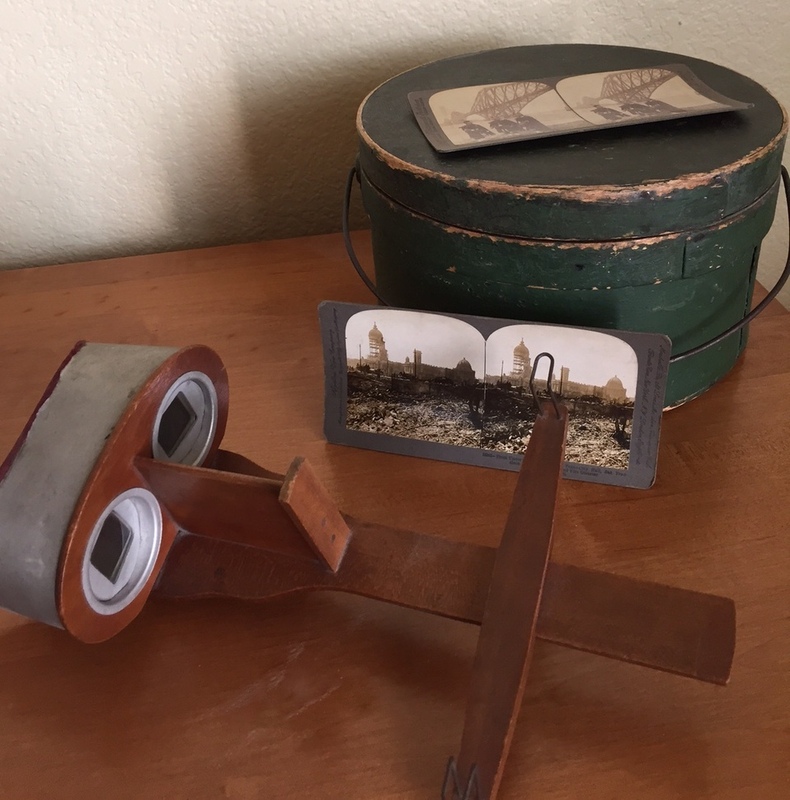 His mother brought home her mother’s stereoscope and viewing cards to keep him occupied while he recovered. The next day, the house belonging to his grandparents burned to the ground, consuming all their possessions. The stereoscope and the wooden hatbox full of viewing cards were the only items that escaped destruction. They sit on my dresser now so I can look at them every day. It’s so important to share our family stories! 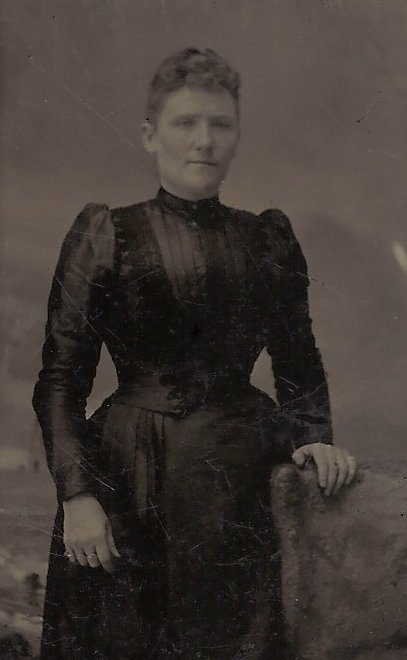 Grandma Mayme, my great grandmother, lived her whole life in Seville Township, Gratiot County, Michigan. She was born near Elm Hall and died at her home at 6691 North Warner Rd., near Elwell. She is buried in the Seville Center Cemetery, also known as the French Cemetery. 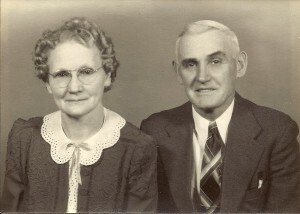 Mayme (Woodward) Hundey and Clarence Hundey in 1946. Photo from the Donna Hundey Burke Weaver Archive. Used with permission. It was not unusual in rural areas for women to join or form groups for socializing and doing charitable work. In Seville Township, the Beaver Creek Ladies Aid Society was formed 09 April 1922. The group’s purpose was to help their local churches, the Seville Church of God and the Riverdale Methodist Church, as well as “to help those who were sick and in need or any other work to aid in the betterment of the community,” according to a 1999 account by Thelma Hamp, who joined “the Aid,” as she referred to it, in 1934. We had yearly dinners for the road commission, many times, at Lumberjack Park, prepared in our kitchen, which was built on the cabin [in the park] by our husbands and other men for only our use. We had dinners in the large part of the cabin which was used as a dining room. The road commission always enjoyed our meals and looked forward to them each year. The men paid a nice price and always tipped us for our nice dinners. We also sold pies and other food when there were other activities in the park. We also cooked for our husbands and other men when they worked at the park. The Aid even had an organ to provide music for park events. Part of the funds they raised went to purchase playground equipment for Lumberjack Park, which many of us remember playing on as kids, and cookout stoves so families could picnic in the park. At some point, the group was told they could no longer sell food in the park, so they auctioned off all their kitchen and dining room equipment “at Mayme Lake’s home.” Thelma’s recollections are a little short on dates, but the auction may have been after 1951 because Mayme Lake was Grandma Mayme’s name after her second marriage, to Floyd H. Lake (1883-1966). Now the Aid had to have their meetings in members’ homes where, Thelma tells us, “we always prepared enough food so our husbands and other men working in the fields could have dinner with us and they would give us one dollar each for the dinners” to go into the group’s coffers. The ladies also sold raffle tickets on handmade quilts and made and sold rag rugs. By 1999, things had changed for the Aid. At one time the group had over 100 members, according to Thelma, but in 1999 they were down to eight. They still met regularly to socialize and raise money by tying off quilts for people. They made scrapbooks and lap robes for people in nursing homes. They rode on a truck in the parade that year that celebrated Riverdale’s 125th birthday. That year, too, they continued their charitable work by giving $50 to the Equipment Locker in Alma, $25 to the Salvation Army, and “a sum” to help the St. Louis Senior Center build a new kitchen. Fifteen years later, I don’t know if the group still exists, but it sounds like they had a lot of fun and did a lot of good between 1922 and 1999. Mayme Hundy [sic] is listed after Thelma’s reminiscences as one of the “Members who have passed on.” The list of deceased members includes Ruth (Shong) Grant (1899-1987), whose husband, Otto Grant (1893-1978) was a Hundey cousin. 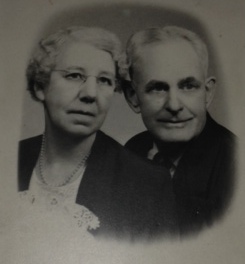 Ruth and Otto were close friends of my grandparents, Harold and Katy Hundey. 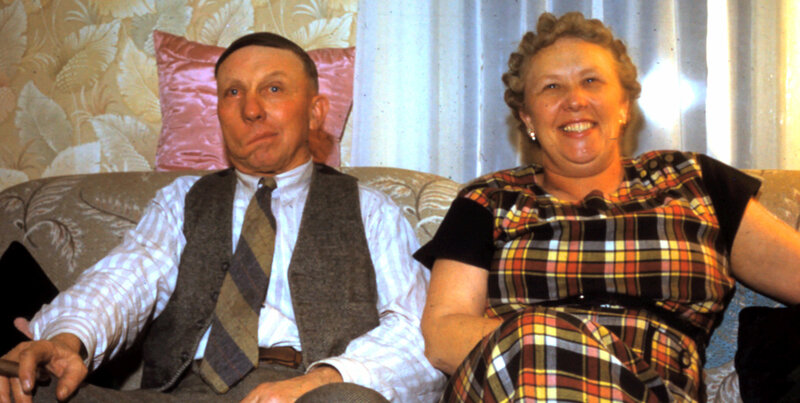 Otto Grant and Ruth (Shong) Grant in 1950 in Harold and Katy Hundey’s living room. Photo from the Donna Hundey Burke Weaver Archive. Used with permission. The list also includes Clara McCoy. Clara is not related to us by blood or marriage, but she took care of my mother in her home while Grandma Katy worked. Mom was a very young child at the time and tried to call Clara Mommy. Instead, Clara told Mom to call her Auntie. Mom and Auntie remained close, and we would often visit Auntie and her husband Harry when I was a kid. I think I was almost a teenager before I realized Auntie wasn’t really her name. “Auntie” Clara McCoy and Harry McCoy in 1950 in their front yard. Photo from the Donna Hundey Burke Weaver Archive. Used with permission. If you go to the website containing Thelma’s account of the Aid and read down the list of former and late members, you’ll find many surnames that have deep roots in Seville Township. We are also related by marriage to the Hamps, though I don’t know at this point just what our relation is to Thelma and to Patricia Hamp, who maintains the website for the Gratiot County Michigan MIGenWeb Project (many thanks to her for all the great information on the site!). 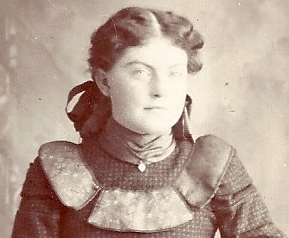 Grandma Mayme’s sister Celia L. Woodward (1869-1916) married Edwin S. Hamp (1863-1940). “Mayme Hundey Lake,” obituary, Gratiot County (Michigan) Herald, 23 December 1971. Clipping in Donna Hundey Burke Weaver Archive. Thelma Hamp, “Beaver Creek Ladies Aid Society, Seville Township, Gratiot Co., Michigan: A Part of Local History,” Gratiot County Michigan MIGenWeb Project (http://www.mfhn.com/gratiot/seville/bclas.htm : accessed 31 August 2014). Some ancestors are easy to find information about and others, not so much. My great-great grandfather, William Burke (1820-1898) and his wife Catherine (Powers) Burke (1821-1880) are looking like they’re going to require some intensive detective work. Much of the information I have about them comes from family word of mouth, collected by my mother back when many of William’s great-grandchildren were still alive in the 1970s and 1980s. This information may or may not be accurate, of course. Lots of factors affect the accuracy of family stories. But there seems to be agreement that William and Catherine were born in Ireland, perhaps in County Cork. I don’t know yet when they married or when they immigrated to America. Eventually, they settled on a farm in West Point Township, White County, Indiana. The families on census page 25 living in West Point Township, White County, Indiana, were enumerated on the 16th and 17th of June, 1880. One family on this page is the household of William Burke (spelled Burk on the record). William, age 60, is listed as widowed. This is in line with some family information that Catherine died earlier in 1880, though by no means proves it. William’s occupation is farming. Ireland is listed as his birthplace, and it’s also listed as the birthplace of his parents. The record indicates that William cannot read or write, which was not uncommon for immigrants at that time. The rest of the household consists of four sons of William, all of whom are listed as single and farm laborers. The record says Michael, age 26, and William, age 24, were born in Ohio. 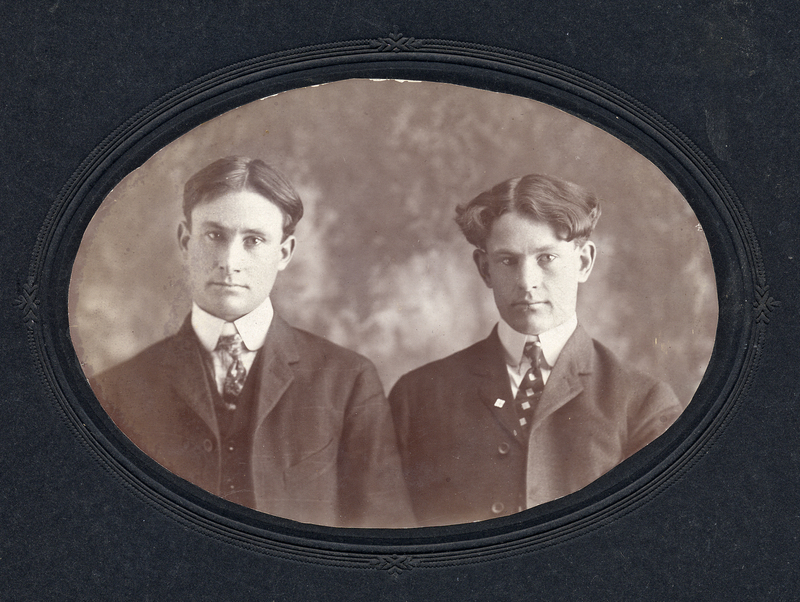 John, age 20, and Richard, age 18, are listed as born in Indiana. We have to remember that information on censuses (or any record, for that matter) should not be taken as gospel. There are lots of errors made in any kind of record-keeping, which is why we always look for multiple sources to confirm facts about our ancestors’ lives. But this census can begin to give us a sense of the shape of the lives of William and Catherine and their family. William’s age is given as 60, so he was born about 1820. Michael was born about 1854, William about 1856, John about 1860, and Richard about 1862. A timeline based on this census information would say that William and Catherine emigrated from Ireland sometime before 1854 and that they lived in Ohio for a few years before settling in Indiana by the time John was born in about 1860. Catherine died sometime before the census was taken in June of 1880. 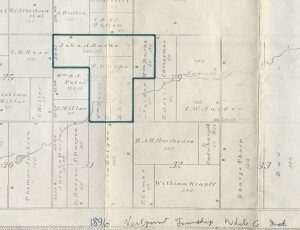 This image is from the 1896 plat map of West Point Township. You will see the farm of Wm. Burke Sr. on 80 acres in the northwest corner of section 29. In section 30, to the west, you will see 80-acre farms for R. Burke, M. Burke, and Wm. Burke Jr. Also in section 30 is a 180-acre farm belonging to John A. Burke. The little black squares indicate where the houses are located on each farm. Now, Michael Burke had died in 1889, but according to family information his widow Agnes lived in White County with her second husband until sometime after 1910 when they and their family moved to Michigan. That could account for the plat map’s showing “M. Burke” on that farm even after Michael’s death. Another question that needs to be researched and answered. It’s a start. There are still lots of questions about this branch of the family. I’ll keep working on them, but if you know anything more about them, please leave a comment and let me know. 1880 United States Federal Census.West Point, White, Indiana; Roll: 324; Family History Film: 1254324; Page: 313A; Enumeration District: 183; Image: 0207. Record for William Burk. http://search.ancestry.com/cgi-bin/sse.dll?db=1880usfedcen&h=28023949&indiv=try. Donna Hundey Burke Weaver Archive. In the possession of the author. Sue Burke Harrington family collection. It occurred to me this week, while I was in pursuit of information about my elusive great-great-great grandfather Michael McGurn (1826-1868), that learning about family places is probably as important as learning about our family stories. I’d hoped to write a post on Michael, but I just don’t know enough for sure about him yet, so I had to shelve that idea for now. Instead, here’s a first installment on a place where the Forquers and McGurns have deep roots: Sumner, Gratiot County, Michigan. My great-great grandfather Reason M. Forquer (1849-1934) came to Sumner in 1873. He farmed and also owned a general store in town. Another great-great grandfather Thomas Henry McGurn (1853-1937), a blacksmith and later a saloon keeper (and son of the elusive Michael), was living in Sumner by 1880, though I don’t know exactly when he arrived. 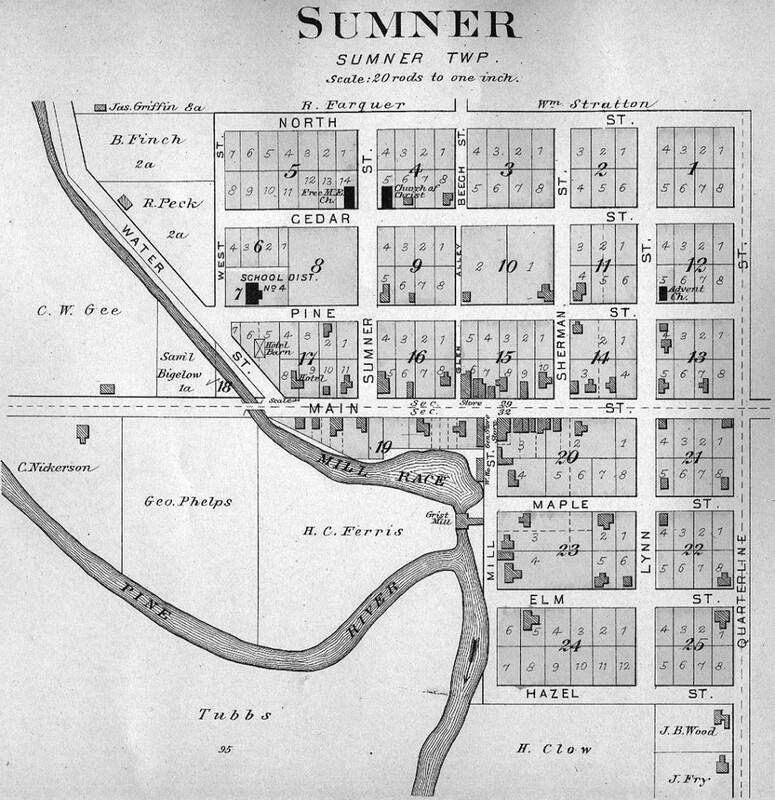 The village that would eventually be Sumner was laid out in 1868 and named Estella. When the post office was established in 1869, it was named Sumner because it was the first post office in Sumner Township. Between 1869 and 1887, the town had one name and its post office had another, until frustrated residents petitioned the board of supervisors to change the name of the village to Sumner. Willard D. Tucker’s history of Gratiot County provides a snapshot of Sumner (and of the whole county, for that matter) in 1913. That year, for instance, the post office was operating two rural delivery routes. One rural delivery carrier was Charles L. Booth (1879-1926), husband of Minnie (Forquer) Booth (1879-1967). Minnie’s brother Arthur Reason Forquer (1881-1951) was my great grandfather, and I knew Aunt Minnie when I was a child. 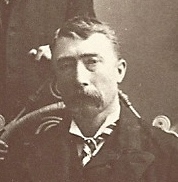 The other delivery carrier was Elmon Jesse Evey (1869-1932). Elmon’s son Walter Evey (1901-1991) became my great uncle Walter by marrying my grandmother’s older sister Opal Jeanice (Forquer) Evey (1903-2006). In 1913, Sumner’s school had two teachers and ten grades. There were churches in town for Free Methodists, Adventists, and members of the Church of Christ. You can see the school and the three churches on the map. Businesses in Sumner in 1913 included a flour mill, a hotel, and a blacksmith shop. There was also a resident physician. Several stores sold general merchandise, including the store owned by my great-great grandfather Reason Forquer, which he would later sell to his son Arthur Forquer, my great grandfather. That’s a start on the history of Sumner and its relation to our family. More to come in later posts. 1880 United States Federal Census. Census Place: Sumner, Gratiot, Michigan; Roll: 580; Family History Film: 1254580; Page: 639C; Enumeration District: 102; Image: 0377. Record for Thomas Mcgurn. http://search.ancestry.com/cgi-bin/sse.dll?db=1880usfedcen&h=22275303&indiv=try. 1900 United States Federal Census. 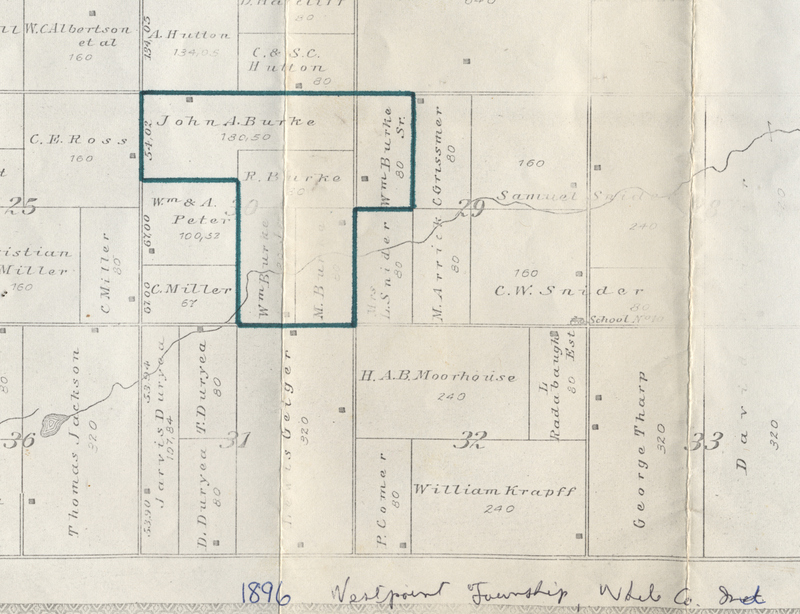 Census Place: Sumner, Gratiot, Michigan; Roll: 713; Page: 21B; Enumeration District: 0060; FHL microfilm: 1240713. Record for Thomas H Mcgurn. http://search.ancestry.com/cgi-bin/sse.dll?db=1900usfedcen&h=24777605&indiv=try. Centennial Committee. Sumner Michigan, 1868-1968: Centennial Yearbook. 1968. Death Certificate, Michigan Department of Health, Certificate of Death: Reason M. Forquer. 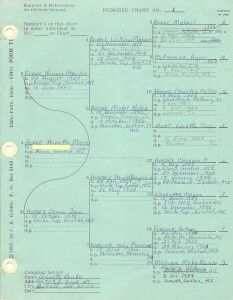 Donna Hundey Burke Weaver Archive. My husband’s great-great-grandparents, Hugh Doak (1816-1888) and Jane (Gibson) Doak (1827-1907) and their eldest child, toddler Margaret Doak (1846-1924), embarked for New York from Belfast, Northern Ireland, on the ship Margaret in 1849. In the midst of famine and economic troubles, the young family from County Down were in search of a better life in America. There were 133 passengers from Belfast listed on the manifest when the Margaret arrived in New York on November 16, 1849. The record only shows when they arrived, not when they departed, so I can’t tell how long they were at sea. The Atlantic crossing at this time could take anywhere from three weeks to three months, depending on weather conditions. I haven’t been able to find any more information on the ship they sailed on, except that there was a ship called the S/S Margaret that served for the Cunard Line between 1840 and 1859. The remarkable part of the voyage of the Doaks, however, is that a second child, daughter Mary Jane, is listed on the ship’s manifest as “born at sea.” So great-great-grandmother Jane gave birth on the Atlantic, in the late fall, in steerage. The conditions on board an immigrant ship were neither hygienic nor comfortable. Steerage was crowded, cramped and airless, and passengers even had to cook their own food in a tiny shared kitchen. One doctor reported that competition for cooking facilities were sometimes so fierce that a woman could only manage to prepare one meal a day for her family. Here is one description of the conditions, which “varied from ship to ship, but steerage was normally crowded, dark, and damp. Limited sanitation and stormy seas often combined to make it dirty and foul-smelling, too. Rats, insects, and disease were common problems” (Smithsonian). Even more remarkable, eight other children besides Mary Jane were listed on the manifest as “born at sea” during the ship’s passage. Hugh and Jane went on to have eight more children of their own after they settled in Pittsburgh, Allegheny County, Pennsylvania. 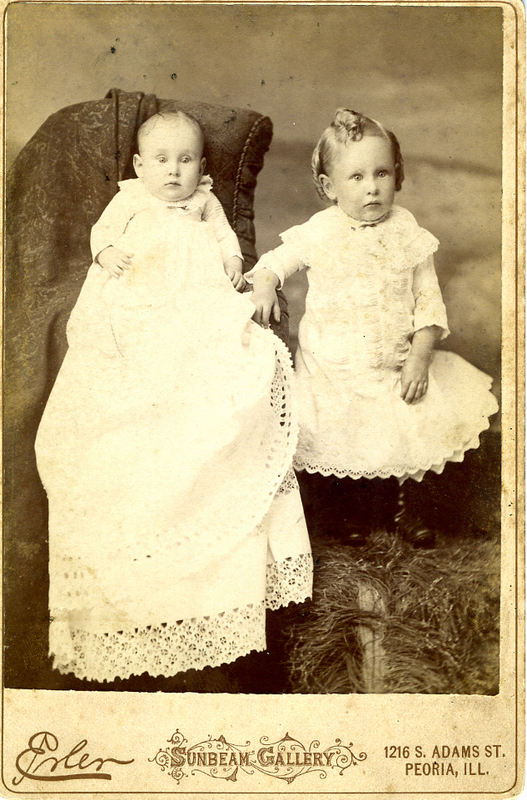 And Mary Jane (Doak) McCombe (1849-1937), the child born at sea, lived to the ripe old age of 88. Smithsonian Institution. “Enterprise on the Water.” http://amhistory.si.edu/onthewater/exhibition/2_3.html , accessed 19 July 2014. 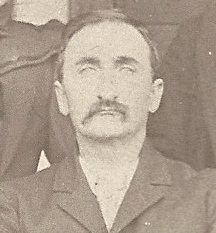 Dobie, William Currie. “Sailing Across the Atlantic Sixty Years Ago.” The Thunder Bay Historical Society Fifth Annual Report; Papers of 1914. pp 35-38. Transcribed by Charles Dobie. http://freepages.genealogy.rootsweb.ancestry.com/~cdobie/g-sail.htm , accessed 19 July 2014. Irish American Journey.com. “Irish Ships To America.” http://www.irishamericanjourney.com/2011/10/irish-ships-to-america.html , accessed 19 July 2014. Norway Heritage.com. S/S Margaret, Cunard Line. http://www.norwayheritage.com/p_ship.asp?sh=marga , accessed 19 July 2014. Families are funny things, and their dynamics are complicated. Even though I was 18 when he died, I never met my Grandpa Bill’s (William Michael Burke [1888-1956]) older brother or any of his family. Jack and Bill were the sons of Michael Burke (1854-1889) and Agnes (McCormick) Burke (1863-1918), my great-grandparents. The boys were barely toddlers when their father died, aged 35, in an industrial accident in Peoria, Illinois. Their mother took them back home to White County, Indiana, where both she and Michael had been born. On 31 January 1893, Agnes married her second husband Franklin Riggs in White County. They lived in West Point Township, White County, Indiana, until they moved to Arcada Township in Gratiot County, Michigan sometime between 1910 and 1920. 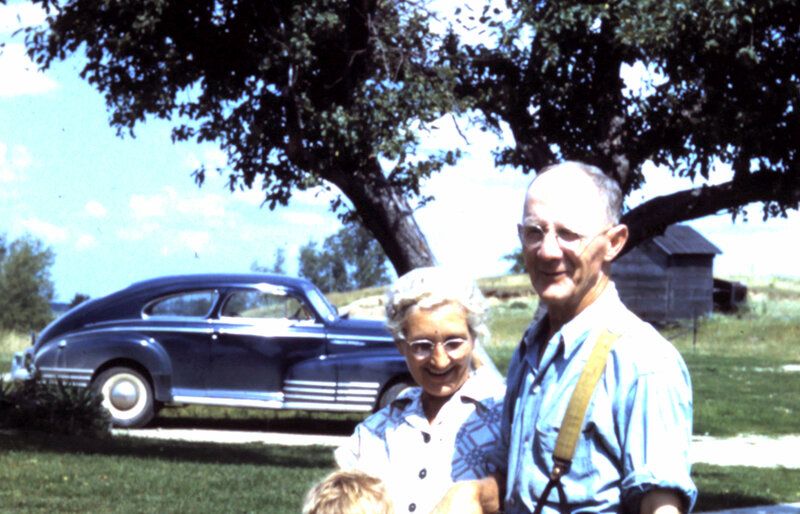 Arcada Township is where Grandpa Bill’s farm was, but I don’t yet know where Agnes and Frank lived in the township. Frank and Agnes had eight more children, in addition to the boys from her marriage to Michael. It’s easy to imagine that Jack and Bill might have felt marginalized in this big, new family. There’s no way to know at this point what kind of stepfather Frank was, but I remember my father occasionally mentioning his name in a not-very-nice tone of voice, perhaps passing on his father’s attitude. I don’t know. Frank died 9 January 1952, six months before I was born. But back to Jack and Bill. Jack lost his right arm in a hunting accident when he was young. According to his granddaughter, Carole Grimes, Grandpa Bill accidentally shot him – yikes. On 10 February 1915, Jack married Dorthea Belle Miksell (1890-1965). The 1920 Federal Census shows them farming in Arcada Township, Gratiot County, Michigan. By 1927, though, they were living in Michigan City, Indiana, where they remained for the rest of their lives, living at 1515 W. 10th St. Jack worked for the Pullman railway car manufacturing company, painting rail cars. It’s a shame when close family members don’t know each other, but I’m very happy that 21st Century technology has allowed me to connect with cousin Carole, Jack’s granddaughter. 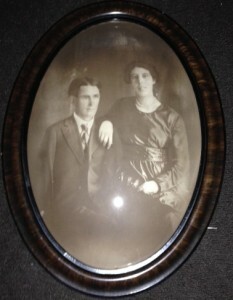 And I’m grateful that she’s given permission for me to share these great pictures of her grandparents. Ancestry.com, U.S., Social Security Death Index, 1935-Current (Online publication – Provo, UT, USA: Ancestry.com Operations Inc, 2011. http://search.ancestry.com/cgi-bin/sse.dll?db=ssdi&h=8175678&ti=0&indiv=try&gss=pt. The Bliss family has been in America since about 1635. Though there are still a lot of facts for me to sort out and document about the earliest Blisses and their relationships, I’ve established through good sources that my grandfather, Harold Benjamin Hundey (1907-1987), is descended through his mother, Mayme (Woodward) Hundey (1889-1971), from Samuel Bliss (1734-1786), who was a Minuteman in the American Revolution. Samuel, my 6 times great-grandfather, was born 11 February 1734 in Brimfield, Hampden County, Massachusetts. On 3 December 1758, he recorded his intention to marry Mary Gleason. They married 1 February 1759 at Warren, Worcester County, Massachusetts. As the Battle of Lexington was being fought on 19 April 1775, the alarm went around the countryside for the Minutemen to march to defend the areas around Boston that were threatened by British troops. Samuel was 41 years old and he and Mary had nine children, but he answered the call as part of Captain Josiah Putnam’s company in Colonel Jedediah Foster’s regiment and marched to Roxbury, Massachusetts, for an eight-day campaign. The distance from Warren to Roxbury was more than 60 miles. Samuel re-enlisted at the end of the campaign, on 26 April 1775, and served in Captain John Granger’s company in Colonel Learned’s regiment until 7 October 1775. I’ve found a couple sources that say Captain Granger’s company may have fought at the Battle of Bunker Hill on 17 June 1775, but I haven’t established that for sure yet. On our Hundey side, we have close to a dozen Revolutionary War veterans, but Samuel is the only one who answered the alarm after the very first battle of the Revolution. He’s our only Minuteman. It’s interesting that Laura (Tompkins) Crout, my 3 times great grandmother, has two great grandfathers who fought in the Revolution. 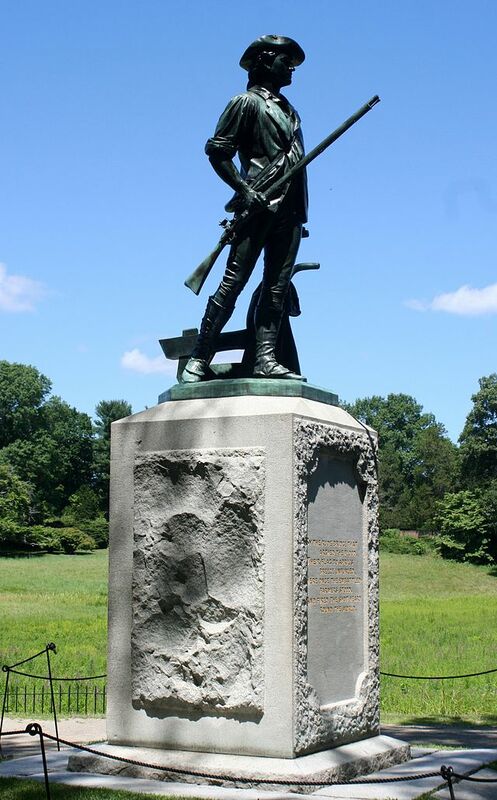 In addition to Samuel, her great-grandfather Solomon Tompkins (1740-1823) was also a Revolutionary War soldier. Dodd, Jordan, Liahona Research, comp, Massachusetts, Marriages, 1633-1850 (Provo, UT, USA, Ancestry.com Operations Inc, 2005), Ancestry.com, Record for Samuel, Jr. Bliss. Godfrey Memorial Library, comp., American Genealogical-Biographical Index (AGBI) (Provo, UT, USA, Ancestry.com Operations Inc, 1999), Ancestry.com. I’ve been meaning to start this blog for a very long time, and finally I just decided to get on with it. My mother, Donna Jean (Hundey) Burke Weaver (1930-2003), and I took an adult ed class in genealogy in about 1974 at Northern Illinois University in DeKalb, DeKalb Co., Illinois, where we were living. We’d both been interested in genealogy, but we didn’t really understand how to go about family history research in an organized way. The class was an excellent introduction to all the forms and methods of research available at the time. I wish I could remember the name of the woman who taught it, because I’d like to try to track her down and thank her for getting us started down this road. After the class, Mom and I worked on getting information from older relatives, sending away to county courthouses for documents, traipsing through cemeteries, tracking down books that might contain information on our forebears — all the activities that characterized pre-Internet research. As my career became more busy, I had little time to spend on it, but Mom kept on plugging. When the Internet came along, Mom embraced email for contacting family members at a distance, Family Tree Maker for organizing her records, and FamilySearch for early online research. She bought a laptop to take on her trips to the Family History Library at Salt Lake City and to other research locations. She would love all the things we can do with technology these days! After she died, I inherited the boxes and boxes of stuff she’d accumulated, along with her Family Tree Maker files. I was still working, and would still be for another eight years, so I was unable to do anything about organizing and sharing all the great information she’d found. But now that is my work in retirement. In the meantime I had done a lot of thinking about the best way to give other family members access to these treasures of family history. 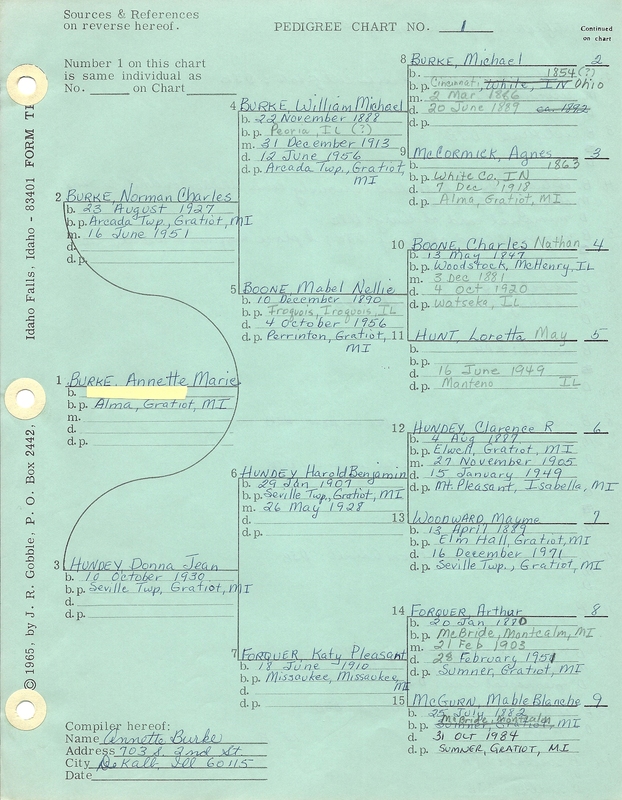 While pedigree charts and death certificates get us genealogists excited, they’re pretty dry in themselves. It’s the stories they tell that can capture the imagination. This blog is for telling those stories, so my extended family can take part in the delight that comes from learning about those people who came before us, and so that they and I can honor the love and hard work that went into making our own lives possible. And I’ve just told my first family story….